The new Chanel Complexion Complete CC Cream is the part of the newest crop of skin performance products, CC cream. The 'CC' in CC cream supposedly stands for color correct, and there are only a handful of these products available. Most notably the Chanel, since it is quite difficult to procure, the Olay drugstore version since it is the only one easily accessible to Americans, and the Rachel K version that is most popular in Asia, especially with those who are too tan for the Chanel version. These new tinted creams are essentially BB (Blemish Balm) creams on steroids, the "mother" of all BB creams if you must. They are all intended to restore the condition of the skin while protecting it with SPF, but the CC cream has a greater focus on concealing pigmentation, fine lines, and wrinkles. 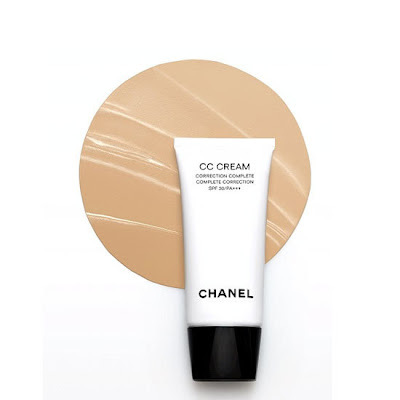 I have only tried the Chanel version thus far, and I must admit that though this CC cream is not a miracle product, I much prefer it to almost all BB creams I have tried. Since I had so few positive experiences with BB creams, I started testing this CC cream without any expectations. The Chanel CC cream, however, took me by surprise. It did not cause any breakouts and more importantly, did not look ashy against my yellow/golden undertones. Most BB creams tend to impart a grey lean, dulling the complexion.. this Chanel CC cream brightened up my face, and the yellow base of the 20 Beige shade is brightened, just as with Armani's newest "blue sphere" technology used in the Designer Lift foundation. I love the overall effect, though the color is indeed very fair and anyone darker than light-medium will find this product too high maintenance. I generally wear a B30 in Chanel, but I managed to manipulate the color of this cream by setting with the right powder foundation and topping off with a bronzer. UPDATE: I also love mixing it with MatLumiere in 40, about a 60/40 mix (more of the CC Cream). I can imagine that those usually wear 30 or 40 in Chanel face products up might not want to splurge for this product, but if you are just one shade too tan for this CC cream as I am, then it is worth the splurge. There are more details about the product, as well as comparison swatches, included in the video if you are interested! The most noticeable difference between the Chanel CC Cream and my favorite Blemish Balm, the Dior DiorSnow BB cream, was that the former lasted at least an hour longer on my skin without breaking down and/or becoming patchy. I can stretch eight immaculate hours of wear from the Chanel CC with powder foundation to set if I blot around the fifth hour. The Chanel is also superior when it comes to minimizing the appearance of pores due to the high silicone content, and it can be used as a base/primer for cream or liquid foundations when medium to full coverage is desired. As Cafe Makeup noted in her incredibly helpful review, a little bit of the Chanel CC Cream goes a LONG way and never cakes up. Half a pea-sized squeeze of the tube works for the entire face. Just make sure to apply in sections with the BeautyBlender or fingertips and blend quickly! 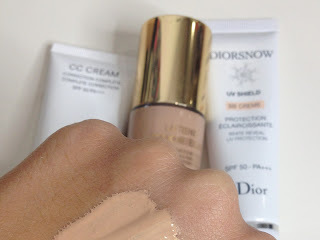 Now, going back to the favorites comparison.. As much as I love the Dior DiorSnow BB, it tends to settle in pores and lines more noticeably than with the Chanel CC. Both accentuate dry patches. If you want to use either of these products, you must exfoliate regularly for these creams will accentuate every flaky patch. The DiorSnow BB feels thicker and heavier, leaving a noticeable sheen on the skin that quickly becomes an unattractive greasy look around the mark of three hours. The upside? Dior's BB provides more coverage on its own. It may not be by much, but the DiorSnow BB cream covers blemishes enough to the point where I can do without adding concealer. And it manages to cover the pigmention on my right cheek just as well as the Chanel CC cream does. One downfall of the Chanel CC cream is that even with buildable medium coverage (about 4 to 5 carefully applied thin layers), blemishes were apparently not included in the chemistry of the concealing effort. I do have a bit of hormonal spotting at the moment, and you will see that the blemishes are still obvious before I apply concealer and powder. Please refer to the tutorial section of video below. Bottom Line: Despite the limited availability and shade selection, I love and recommend it! Price: $55 USD for 1.0 oz. Availability: Now available at Nordstrom and all Chanel counters. i would love to know where you got your top Rae! it's absolutely chic! I was transiting in Taipei International Airport and it was sold at $58US! CHANEL seems to be cheaper in Asia, in Kuala Lumpur the CC Cream retails for MYR165 which is equiv to USD53. CLARINS is also coming out with a BB cream very soon and I would love to know your thoughts! I recently purchased this in China and it was RMB315 which is only 50 US dollars..
Just bought it yesterday, cost RM 165,manage to discount with shopping voucher worth RN 20,so at the end I just paid RM 145 for it. I like the texture as it's not oily compared to those BB cream.Definitely recommend this good product!